My insider's guide to Carmel travel, officially called Carmel-By-the-Sea, offers you everything you need to plan your stay in this lovely waterfront town. You will find tips on the best things to do and see, what to pack, and where to stay. You will also find some ideas on where to eat, what to expect from the weather, and some of the top events all around the Monterey Bay. You will find the places here don't have exact addresses such as 123 Main Street. Many of them will give you the cross streets (such as San Carlos St & 7th Ave) or what else is nearby as part of their address. These addresses will work in GPS, so you can easily find where you need to go. You will find dozens of fun things to do during your Carmel travel vacation. These are three of my favorites. Click the link below for an entire list of the best Carmel activities all year long. Shopping: You will find tons of fun places to go shopping in Carmel-By-the-Sea. All around its "downtown" area, you will find boutique shops with clothing, jewelry and other fun items for sale. It's mostly outdoors and a great way to spend an afternoon--or an entire day if you really want to enjoy this laid back and scenic town! You will find the shops along Ocean Avenue and on the blocks surrounding it. Wine Tasting: Another top pick to do while on Carmel travel vacations is to go wine tasting. In the same area mentioned above, you will find several fun places to taste local wines. Some of my current favorites include Scheid Vineyards (San Carlos St & 7th Ave), Blair Estate Tasting Room (The Carmel Plaza Mission Street between Ocean and, 7th Ave), and De Tierra Vineyards (Mission St & 5th Ave). This area is well known for their incredible Chardonnays and Pinot Noirs, but they will have pretty much anything your heart, and taste buds, desire. The Carmel Valley wine region is also a quick drive or bus ride away from town. Here you will find more than a dozen wineries in the region and many are easy to walk to if you want to enjoy the scenery at the same time. Learn more about wine tasting in this area. Beaches: People love to head to the beaches here. You can cruise out for a picnic lunch, grab a little sun, or just hang out and relax. The largest and most popular beach is Carmel Beach, which is at the end of Ocean Avenue. The Carmel River State Beach is another great one and is a bit more remote and quiet. You will also find a couple of beaches within Point Lobos State Natural Preserve, which is about 10 minutes south of town. You will find more than a dozen great restaurants both north and south of Ocean Avenue. Many of them are higher end options with wonderful wine and cocktail menus in case you just want to hang out, be a part of the scene and not have a full meal. Some of my favorites here include the Dametra Cafe (Greek, Mediterranean at the corner of Ocean and Lincoln St), La Bicyclette (French, near Dolores St and 7th Ave), and Brophy's Tavern (American Sports Bar at 4th Ave & San Carlos St). Another way to sample all that Carmel has to offer is to head out on this fun Food Walking Tour. In this 3-hour excursion, you'll get the chance to sample both food and wine at local restaurants. You will try items such as chocolate, pasta, olive oil, and wine. It's a great way to learn more about the thriving local food and fine dining scene here. Get more details and check for ticket availability. 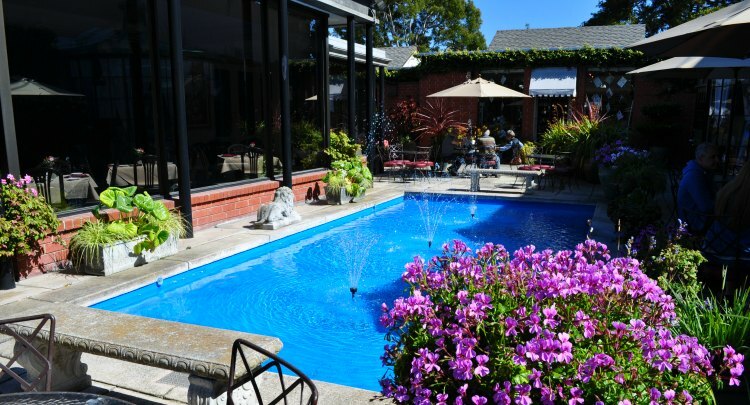 Even though most of Carmel-By-the-Sea offers high-end options, you will find lodging at all price points here. There are hotels that start at around $150 a night and range up to $500 or more. If you plan to stay for a night or two for your Carmel travel vacation, then here are some fun and classy places that I recommend. Click the link below for additional ideas on where to stay around Carmel-by-the-Sea. 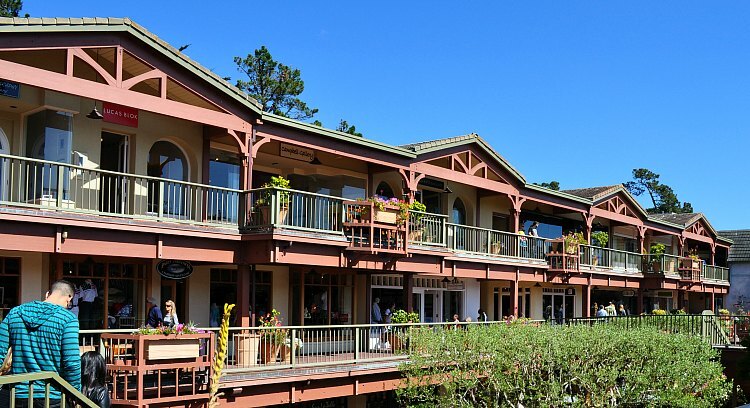 Carmel Bay View Inn: This 2.5-star gem is less than a half mile from the heart of the action in Carmel-By-the-Sea. It offers free internet, parking and breakfast. Once you are settled in, you will easily be able to walk to restaurants, shops, and wine tasting rooms in 5 to 10 minutes. You will find it on Junipero Street, Between Fifth and Sixth Street. Check Booking.com for room availability. Wayside Inn: This 3-star inn features just 22 guest rooms and suites. Some rooms offer full kitchens, spa tubs, and balconies that look out over the village. There is also free parking, internet and breakfast. You will find it at 7th and Mission Streets. Find rooms for your stay on Booking.com. L'Auberge Carmel: This high-end, 4.5-star hotel is just blocks from both Carmel Beach and the restaurants and shops around Carmel. This luxury European-style hotel features just 20 guest rooms. The hotel also features a charming 9 table restaurant with more than 2,500 wines on their list. Free parking, internet and breakfast are included with each room. You will find it on Monte Verde Street at Seventh Avenue. Check room availability for your stay. 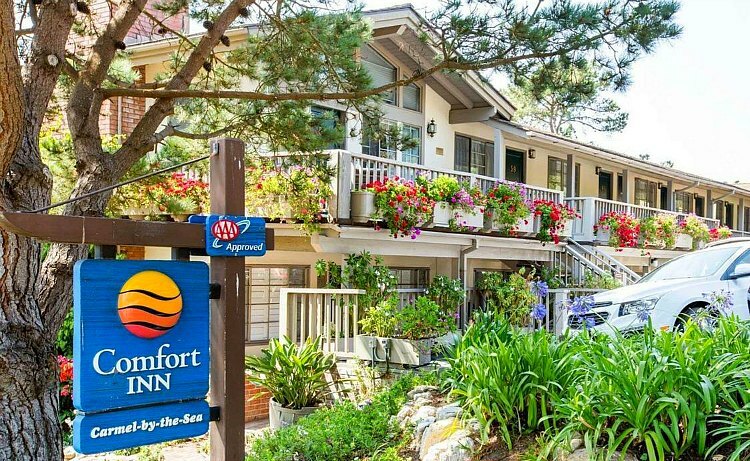 Comfort Inn Carmel-By-the-Sea: This is the perfect place for anyone looking to find a budget-friendly option in the area. This quaint hotel is just across the street from the all the best shopping around Carmel-By-the-Sea. This 2.5-star hotel offers just 20 rooms with free parking, breakfast, and internet. It's located at on Ocean Ave. & Torres Street. Find rooms for your stay. One of the reasons people love their Carmel travel vacations is the weather since you will find mild temperatures all year long. The winds off the ocean keep it cool and comfortable no matter which season you decide to stay here. The high temperatures here vary from around 60 to 70 degrees all year long. September is the warmest month with the highs around 70. The coolest time of year is December and January with temperatures just below 60 each day. You will want to plan your clothing choices since even during the summer months the temperatures will cool off quickly at night with most evenings dipping down to around 45 to 50 degrees. The warmest evenings are also in September and the coolest evenings are in the winter months. What should you wear during your Carmel travel vacation? You will want to pack a variety of layers. This way, you can add and remove items throughout the day as the temperature changes. Our rainy season in Northern California is from November to March, with January and February being the two rainiest times of the year with more than 4 inches per month. In comparison to that, during the summer months we get barely a trace of precipitation and only about an inch in the spring and fall months. I often wear a short-sleeved shirt paired with a light sweater or jacket. At times, I'll often have three layers (short-sleeved shirt, light sweater, light jacket) so I can really adjust as the temperature changes or the sun comes out from behind the clouds. I also favor pants over skirts as it can get windy here at times. Pants also help keep me a little warmer as the temperatures cool off at night. During your Carmel travel vacation, make sure to check out some of the top events in this area. You will find some great ones at the Sunset Center and some of the many fun festivals throughout the year. Top picks in Carmel-By-the-Sea include the Carmel Jewish Film Festival in March, the Pebble Beach Wine & Food Festival in April and the Carmel Art Festival in May. Other top options include the Carmel Bach Festival in July, Carmel-by-the-Sea Concours on the Avenue in August, and the always jolly annual Tree Lighting & Carmel Plaza Party in December. Click the links below for a full calendar of events by month for Carmel-By-the-Sea as well as other towns around the Monterey Bay area. Monterey Aquarium of the Bay: Head north to the city of Monterey and visit one of the best aquariums in the world. Only a quick 15-minute drive away from Carmel-By-the-Sea, this incredible aquarium is home to more than 500 plant and animal species that call the Monterey Bay home. Pick up advance tickets so you don't have to wait in line when you arrive. 17-Mile Drive: The famed 17-Mile Drive is just north of Carmel. You can enter from the south through the Carmel Gate (head north on N. San Antonio Avenue to find it). You will see all that Pebble Beach has to offer as you cruise along it and see the amazing golf courses, the Lone Cypress, and so much more including the Pacific Ocean's beautiful beaches. You will find more than a dozen stops along the way. 17-Mile Drive is open daily from sunrise to sunset and costs just over $10 per car. Monterey with Kids: If you are traveling with your entire family, you will love all of the kid-friendly options around the Monterey Bay. Head to the beach, check out the exotic animals in the local zoo, or test your skills at the Mirror Maze. Find a list of my favorite this to do with kids all year long.